The Amalgamations Group - Groups - Plantations - Stanes Amalgameted Estates Ltd. 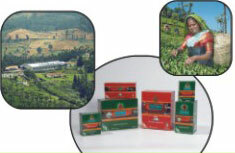 The United Nilgiri Tea Estates Co. Ltd.
Stanes Amalgamated Estates Limited, beautifully carpeted in the Blue Mountains of the Nilgiris, was established in 1946 and became part of Amalgamations Group in 1961. The gardens - Kotada, Deepdale, Crofton, Welbeck and Cairnhill, are situated at altitudes of 1500 metres to 2200 metres above MSL. The speciality of these gardens is the manner in which tea is grown, taking into consideration the ecological and environmental factors. Teas are absolutely hazard, pollution & pesticide residue free. Some of the finest teas found abroad, especially in Germany, UK and USA, are from these gardens. Gardens ensure the cultivation, manufacturing and packaging norms conform to International standards. The gardens are compliant for ISO 9001-2008 and HACCP 2006 standards. Welbeck & Cairnhill situated at an elevation of 2200 metres above MSL just 8 kms away from OOTACAMUND and Deepdale and Goonjara of Kotada are Organic certified by IMO. Speciality high growns - Golden Tips, Silver Tips, Velvet Tips and Green Tea.